A careful study of mathematics, astronomy, and sacred symbolism reveals that many sites encode within them very ancient, timeless, and universal messages. Intended to stand the test of time, they have delivered their messages to people searching for truth ever since. Among them include messages about our planet, the nature of reality, the interconnectedness of creation, and the purpose of life. This is why studying how and why these ancient monuments mark certain celebrated astrological events, and the symbols they used, can reveal hidden information about their greater significance and meaning. Here are a few of the most extraordinary cases in relation to the meaning of the autumn equinox (however, any site which aligns to the autumn equinox also aligns to the spring equinox, so you can find more sites aligned to the equinox in the article Ancient Sacred Sites Aligned to the Spring Equinox). 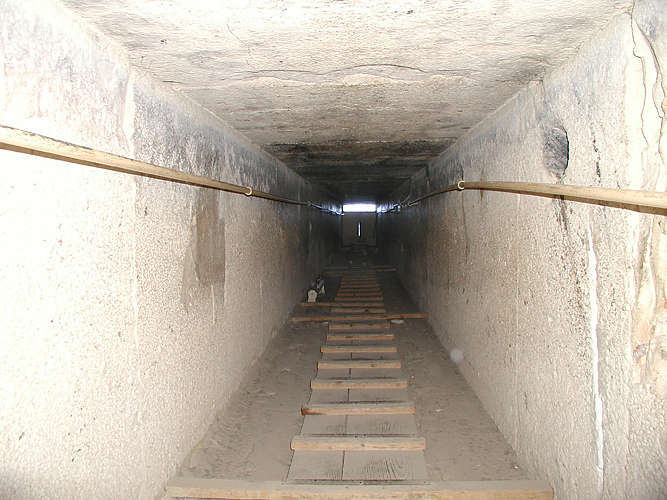 Looking down the descending passage of the Great Pyramid (photo © by Jon Bodsworth). At midnight on the autumn equinox in 2,170 BC, the pole star Alpha Draconis/Thuban, the chief star of the constellation Draco, depicted as a dragon and associated with the most deadly monster of Greek mythology called Typhon, shone down the central axis of the descending passage of the Great Pyramid. This was the North Star at the time. It is calculated that at precisely the same instant in 2,170 BC, Alcyone, the star in the Pleiades group which our sun and solar system revolves around, stood exactly on the meridian of the Great Pyramid at that point in the heavens which is at a right angle to the downward inclination of the descending passage. Alpha Draconis also aligned with the descending passage in 3,350 BC. The next alignment was much more recently in AD 2004 with the North Star Polaris, in which its light was said to shine all the way down to the subterranean pit inside the pyramid on the autumn equinox. Polaris is a star in the constellation Ursa Minor, which the Egyptians identified with the god Seth. This god was seen as the god of darkness, which the Greeks associated with their god Typhon. The Great Pyramid itself functions as an enormous sundial. Its shadow to the north, and its reflected sunlight to the south, accurately mark the annual dates of both the solstices and the equinoxes. Two of its faces are oriented precisely due east and west, which are the exact points of the rising and setting sun, only on the spring and autumn equinoxes. The four sides of the Great Pyramid are concave, which actually gives the pyramid eight faces instead of four. This is only perceptible from the air at dawn and sunset on the spring and autumn equinoxes. Professor Robert Temple believes that just before and after these dates the western vertical halves of the north and south faces would have flashed with the sunlight at dawn, when the Great Pyramid still had its white limestone outer casing. The eastern vertical halves of the same faces would have then flashed at sunset. The ceasing of the flash would prove that the equinox had arrived as the sun was briefly absolutely dead-on. This flash of light would have been visible for miles around, and is believed to have even been visible from the moon—from which the pyramid would appear to light up like a star. The seven-scaled feathered serpent at Chichen Itza descending down the nine pyramid terraces at the equinox. At an ancient Maya sacred site called Chichen Itza, there is a pyramid known as El Castillo dedicated to Kukulcán, the feathered serpent. At the equinoxes the sun creates an undulating pattern of light on the nine terraces of the pyramid to display seven triangles of light which link up with a stone serpent head at its base. As the sun sets, the scales undulate and eventually disappear, giving the visual effect of the serpent descending the nine terraces of the pyramid. The pyramid itself is a complex annual astronomical calendar. Its four sides each have ninety-one steps (the number of days between each of the solstices and equinoxes of the year). The feathered serpent is an esoteric symbol found in various cultures (with the serpent symbolizing the higher feminine aspect of the person, and the feathers symbolizing the eagle and the higher male aspect). The nine terraces depict the nine layers of the underworld, which the Maya were aware of. The descent of the feathered serpent down these nine terraces enacts the symbolic descent into the underworld in the process of enlightenment, and the serpent with its seven scales of light, parallels the symbols of descent into the underworld with seven solar bodies in other ancient sites mentioned in this book. Maya cultures periodically built larger temples and pyramids over the top of smaller ones. In the 1930s excavations revealed an earlier temple inside the pyramid of Kukulcán, which had been built over, revealing that this site has more ancient roots. Unfortunately, this site became known for the practice of human sacrifice and bloodletting (along with other Central American sites)—thousands of people were sacrificed at this site, with the statue of Chac Mool and his cup turned up to receive the rays of the sun to his solar plexus, instead used as a platter for human hearts. As often happens, it appears that the culture there degenerated and was taken over by barbarity. Thus the esoteric knowledge became overlaid and overtaken by black magic (as has happened to ancient sites and spiritual teachings continuously throughout the world), giving it a terrible name. It is even recorded in myth that the great teacher Quetzalcoatl, who was symbolized as the feathered serpent, was opposed to human sacrifice. Tragically, his real message was turned away from and distorted as has happened with the message of true love and compassion of so many other great spiritual teachers throughout history. 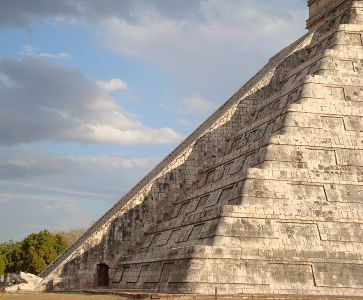 To read more about the incredible celestial alignments of this site see: http://www.world-mysteries.com/chichen_kukulcan.htm. 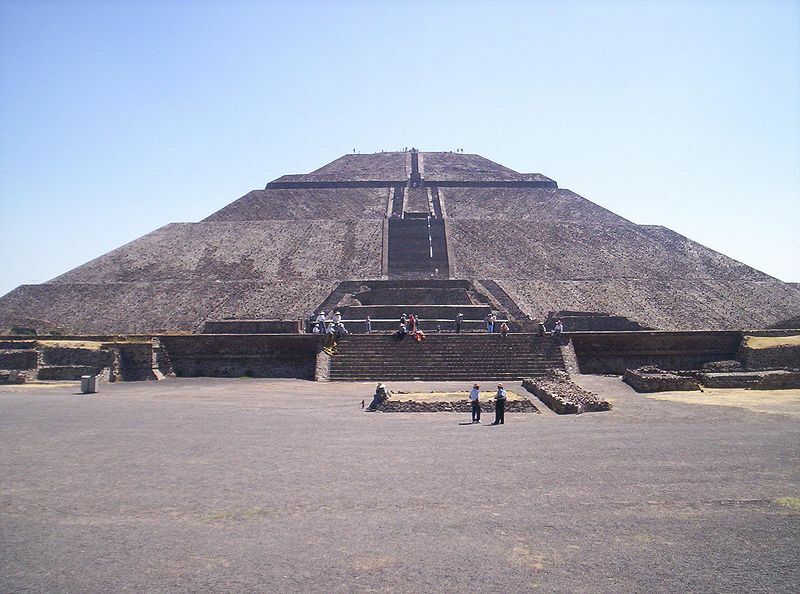 The Pyramid of the Sun which faces the equinox sunsets (photo CC BY-SA 3.0 by Nateirma~commonswiki). The ancient Pyramid of the Sun in Mexico, whose builders are unknown, faces the exact point on the horizon where the sun sets at spring and autumn equinoxes. Seventy meters high and painted red, it was built on top of a cave with four chambers in the shape of a four-leaf clover. In ancient Mexico, caves were seen as passageways to the underworld. Here also, the feathered serpent was worshiped. This is about 1/3 of the chapter on the meaning of the autumn equinox. Keep reading in the book The Path of the Spiritual Sun.